Coffee is my absolute favourite cake..but perhaps not at supper time! Looks delicious. 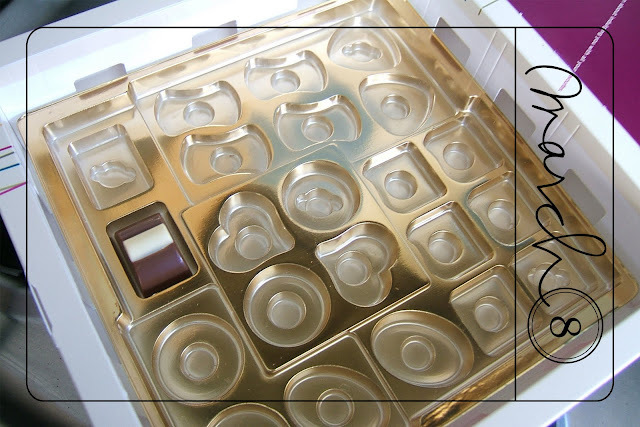 I love the photo of the nearly empty chocolate box--such a great pattern and the light is perfect! No chocolate would last out in the open here. My husband has NO restraint! Wow, that's super impressive - don't know that I'd have managed to just have one a day! Cake looks yummy too! I admire your restraint with the chocolate and it was definitely worth documenting. If it was mine it would not have lasted that long - my kids on the other hand, still have chocolate left from Christmas! Wow - that's quite an accomplishment. I love coffee cake!! Mmmm and that looks yummy! If I want coffee cake I have to make it - which is fine but SOMETIMES it would be convenient to be able to nip out to M&S and buy one ;) lol! That's a great shot of the chocolate box ~ more willpower than me! Coffee cake is my favourite! This looks so yummy!